From accessible barbeques and play facilities to easy to use public transport services and a well-signed roads network, Frankston is easy for everyone to get to, to get around and to enjoy. Changing places toilets and accessible change rooms offering adult hoists with extra space in key locations across the city, including George Pentland Botanic Gardens, the Bayside Centre and PARC. 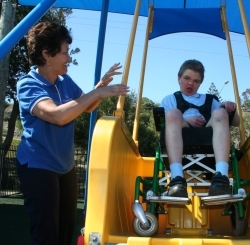 While this website highlights a range of do-it-yourself tours, attractions, parks, gardens, dining and accommodation options which offer easy access to people with mobility limitations, it is recommended that you make contact with individual businesses to ensure that they meet your specific needs. The Frankston Visitor Information Centre are recognised with a ‘Communication Access Symbol’. Chat to the team for more information on accessible locations and experiences in and around Frankston city. Frankston City Council offers a range of services for people with a disability in the Frankston area. For more information use this link. This 24-page booklet highlights a range of do it yourself tours, attractions, parks, gardens, accommodation, vineyards, restaurants and cafes which all offer easy access to people with mobility limitations.